The “native” colours for an HDS (High Definition Survey) point cloud are based on the reflectivity of the surface the measurement is made to and are determined by the intensity of the received reflected laser beam. Whilst this information is useful in its own right it is often desirable to have the points with their “natural” (RGB) colours. A method for adding the “natural” (RGB) colours to the point cloud is to use 360° panoramic images created with an external camera, usually fitted with a fisheye lens. This method is particularly useful where the HDS Scanner does not have a coincident fitted camera system, but can be useful even if there is one, such as with the Leica ScanStation C10, as it gives much greater control over the photography and its manipulation and the images can be recorded at one location whilst the Scanner is deployed at another saving time in the field. It is imperative that the panoramic images are recorded with the Entrance Pupil (Nodal Point) of the camera lens at exactly the same location as the scanning centre of the HDS equipment, although it is irrelevant a to whether the images are recorded before of after the scan. To achieve this, Nodal Ninja provide adaptors to be used with the Nodal Ninja 3 manufactured by Fanotec. 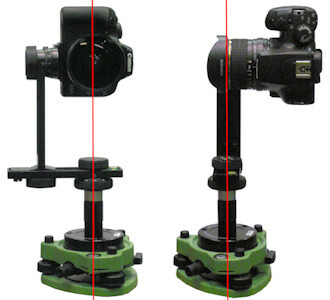 The use of a Nodal Ninja 3 and appropriate adaptor ensures that the camera is at the correct height, but it is important to ensure that the vertical axis of rotation of the camera system is coincident with Entrance Pupil and the correct positions on the upper and lower arms of the panoramic head will depend on the camera and lens being used. Some lenses have a single Entrance Pupil, but that for a fisheye lens slides along the principal ray depending on the angle of incidence and the gold ring is often considered to be the best location for aligning the camera and lens with the axis of rotation, although this is not always true as with the Samyang 8mm lens shown in the photograph, so it is important to establish the correct point for the lens being used. The next item to consider is the number of images required for the panorama. The greater the overlap between the images, the better the chance of the stitching software (e.g. PTGui) being able to create good Control Points, but too great an overlap can cause problems, so a good rule of thumb is to aim for 40% to 50%. The perceived wisdom and general advice is to use six images at 60° intervals with a Sigma or Samyang 8mm lens fitted to a camera with an APS-C sensor, which usually works, but can cause problems with both the image matching algorithms when creating the Control Points and Blending the images when creating the Equirectangular image. With this set up, 8 images at 45° intervals provides a greater overlap giving the stitching software (e.g. PTGui) a better chance of producing good Control Points without any user intervention. The choice of letting the camera select the exposure or to set the exposure manually will depend on the site conditions. Letting the camera select the shutter speed and aperture will often produce good results, but it is important to consider the point at which the camera is measuring the exposure from. In poor lighting conditions, such as in a room, the camera will usually select a wide aperture minimising the “depth of field”, but it is likely that there is a large range in the distances of the subject from the camera so a greater “depth of field” is preferred, in which case setting the exposure manually or using aperture priority with an aperture of f8 or f5.6 will give the best results. 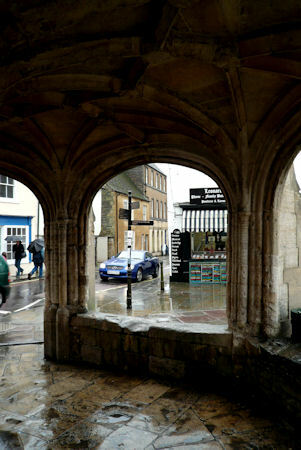 The photograph to the left shows the camera exposing for the street whilst the one to the right has the correct exposure for the subject of interest. The same applies to focus. Using autofocus can result in focusing on the wrong subject so using manual focus, if available, is recommended. 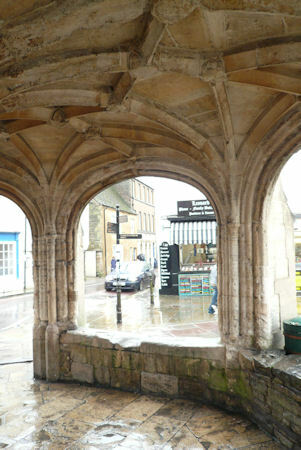 In this example the focus will be on detail much further away than the subject of interest. Also, lack of detail at the point the lens is attempting to autofocus on will cause the lens to “hunt”, which could result in a “soft” (out of focus) image or no image being recorded. Using an aperture of f8 or f5.6 can result in slow shutter speeds, especially in poorly lit rooms, but as the camera is mounted on the same tripod as used for the HDS Scanner it is rock steady so this is not a problem. However, it is recommended to use a remote release to avoid any camera movement during long exposures. As mentioned, the use of an external camera solution provides maximum control over the photography. This does not only apply to exposure, focus and white balance, but allows for HDR (High Dynamic Range) photography to be used, which is a technique worthy of investigation. This involves recording a set of images with different exposure values (e.g. 7 images at 1 stop intervals giving a range of -3 to +3 stops). Even if HDR is not going to be used it is worth “bracketing” to ensure correctly exposed images as once the tripod is moved it is not possible to replace the camera with the Entrance Pupil at the same position as the Scanner centre. This presentation has been prepared for the capture of Spherical Panoramas with the NCTech iSTAR camera for use with data scanned with Leica Laser Scanners.